We are just over a week away from seeing Samsung take the stage in NYC to unveil the Galaxy S4, so as expected, the leaks or signs of what’s to come are arriving. Thanks to a reader who ran AnTuTu benchmark this week on his Verizon Galaxy S3, we have another look at what may be final specs for a variant of the next Galaxy. After running AnTuTu’s benchmark on his device, our reader looked to compare it to others in the database, one of which was listed as the “Galaxy S4.” Now, before we get too deep into this, we fully understand that benchmarks can be faked or tweaked, however, these results have typically proven to be reliable in the past. So what did he see? Well, a device that put up one of the best benchmarks we have ever seen. 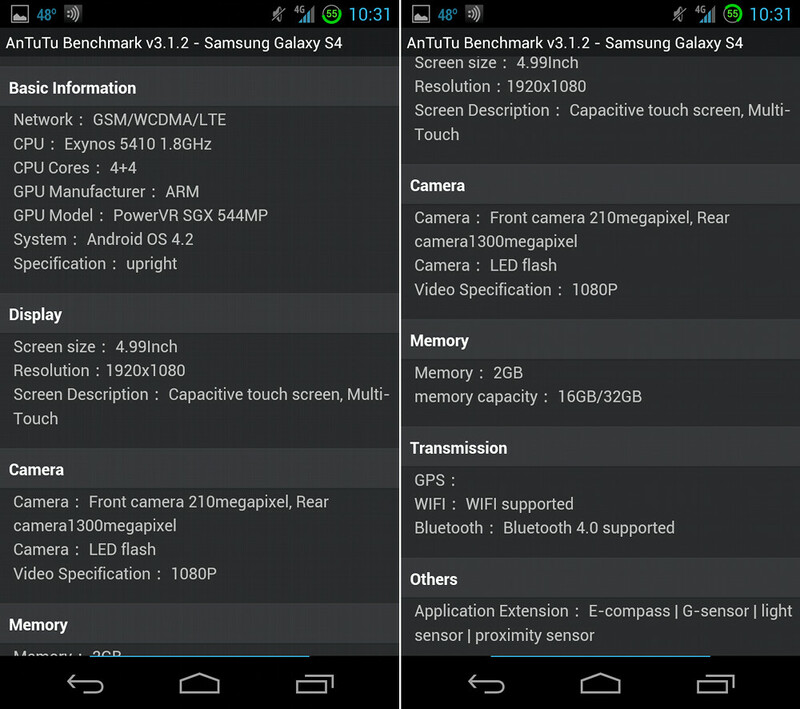 If you take a look at the screenshot to the top right, you’ll see that the Galaxy S4 essentially tripled the score that his Galaxy S3 was able to muster. In every single solo category, the GS4 also put up numbers that would put any other device to shame, outside of the HTC One. The second thing we get from the benchmark is a set of specs that match up to what we have seen a couple of times over the last few weeks. 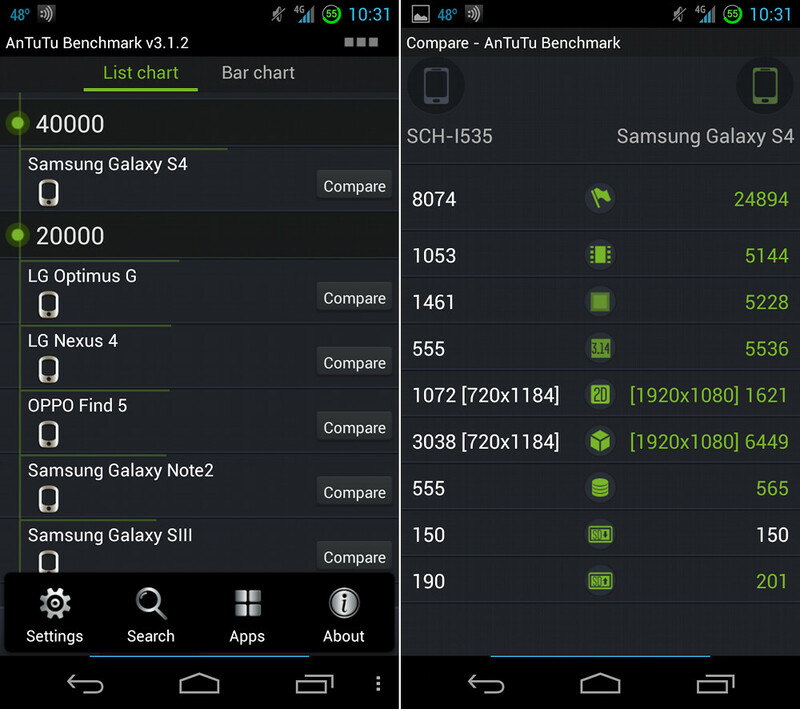 AnTuTu lists a 1.8GHz quad-core Exynos 5410 processor, which may very well be the Octa. We’re also seeing Android 4.2, a 1920×1080 5-inch display, 2.1MP front camera, 13MP rear camera, 2GB RAM, Bluetooth 4.0, and internal storage of either 16GB or 32GB. Nothing necessarily new, but more pieces to add to this puzzle.